VW, Tesco, FIFA and athletics’ IAAF are amongst the global organisations recently humiliated due to corporate malpractice and wrongdoing. Their exposure has led business leaders the world over to question whether their own organisations are hiding similar practices. Financial malpractice and the falsification of key operational data can damage corporate reputation – and kill share value – overnight. But poor business practice also puts lives at risk, as BP found in its notorious Deepwater Horizon oil spill – an incident which the White House blamed on a series of corporate cost-cutting decisions and an insufficient safety system. Issues of this magnitude often seem to erupt without warning, leaving senior management teams, and industry observers, to wonder if warning signs were missed, or if every company is at risk from ‘corporate killers’ hidden in its ranks. Shareholders are understandably annoyed. Promises have not been delivered, shareholder value has decayed. Executive remuneration is seen to continue to soar, seemingly untroubled by delivered performance. Much attention has been focused on those who are accountable for business performance – the board of companies. This is right. The dominant focus for addressing these issues has been the specification of board composition, appointments, board committees and conflicts of interests of Executive and Non Executives alike. This is necessary – but not sufficient. On the lips of accountants and bankers I hear the words “it’s all down to the culture”. Organisation integrity is the result of our actual values and ethics in practice. A culture of integrity is where players in the organisation behave in an ethical way. We need to focus on the internal integrity of the organisation as well as the external governance to build the confidence of the shareholder. It is only through creating an organisation with integrity can the board be confident that their direction is being followed and that the performance numbers they publish to the shareholders are accurate. This article is about how we create an organisation with integrity, how we can develop an organisational culture that gives us the confidence of knowing that the numbers we see are the numbers that deep down we believe. That the decisions made are true to the values and brand we promote and on which our reputation is based. The fields of risk, reputation, performance, and governance all ultimately rest on how we can change the behaviour of individuals, teams and the organisation as a whole. This is the common issue. We can legislate that Boards behave differently but the understandable worry is that we end up with a tick-box mentality that conforms to the letter and little of the spirit. Similarly, we can instruct our Executives to behave differently by imposing codes of conduct. 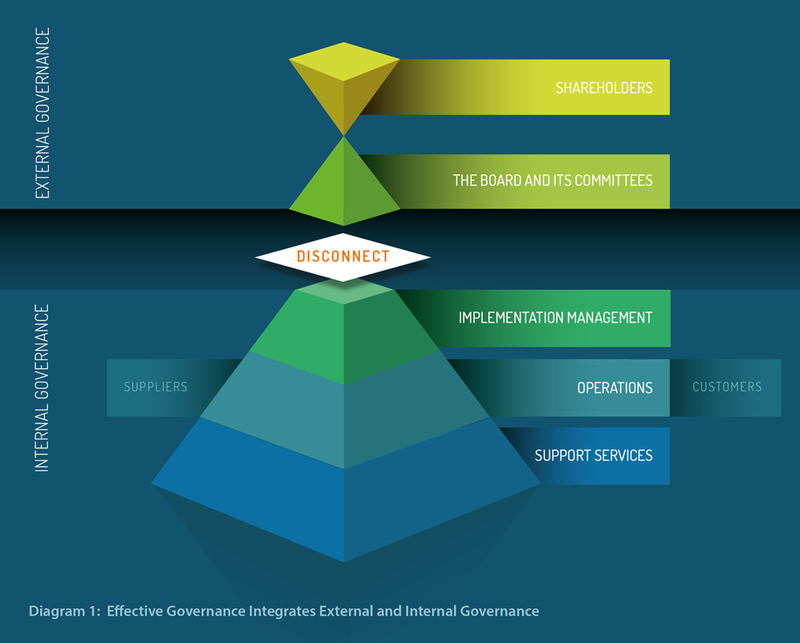 There is increasingly a disconnect within corporations between the focus being placed on external governance and the effort being placed on what we at OE Cam call ‘internal’ governance. Such is the concern in the financial services industry that the Financial Reporting Council (FRC) has set up a culture project to better understand how boards can shape, embed and assess culture. They are due to report later this year. Much has been written on how businesses can comply with company law and codes of best governance practice. The ‘culture’ word is now liberally used without much common definition and alignment on what this word means and what one can do to change it. Clearly this is a vital component but it is the internal governance and organisational integrity on which I wish to focus in this article. The April edition on the Harvard Business Review (HBR) screams “you can’t fix culture!”. I disagree with the headline but as so often with arresting titles, the substance of the article is more nuanced and I find much more to agree with beneath the title. Make sure that your values and ethics are made real: a company’s principles of practice need to be ‘lived and breathed’ in order for them to become the norm. Be explicit about how you expect employees and team members to conduct themselves. All businesses have grey areas that test the true meaning of ethics on a daily basis – for example, loose and flexible interpretation of work in progress, stock levels, and time allocation to clients. These help us to identify the ‘thin end of the wedge’. The VW emissions reports fail to explain why the development team felt the use of so called ‘defeat devices’ was acceptable. It remains unclear whether this was deliberate, or an accumulation of flexible interpretations of requirements set against the need to meet performance targets. A clear business direction gives a sense of overall purpose and provides the context within which each individual and team accomplishes their role. This overall sense provides one means for assessing whether their actions are in the best interest of the company. Most organisations do this rather well. What is often less evident is whether each unit, team and individual has a strong and shared understanding of their accountability and the accountability of those with whom they have to work to deliver the business goals. This needs to include: their authority, the authority to commit, authority to act and their responsibility to communicate openly. Without a common overall picture of ‘who does what around here’ it is really hard for individuals to see the context of their own role – however well defined that may be. The success of values programmes within businesses has a chequered history and this is what is behind the HBR headline. For many it signifies charts on walls, cascades of sheep-dip workshops and a morning after feeling that little has changed save for the cost and time incurred. Changing what is acceptable behaviour takes a long time and an explicit code of conduct and ethics is just the start. They do then have to be translated into practical policies and processes which become embedded into the culture such that they become the commonly accepted way of working. Without a standard, a benchmark of the behaviours that are acceptable and a clear understanding of what is not, the journey to achieve integrity has no direction or compass. Conspicuous consumption by senior members of staff can set the wrong tone, while a clearly stated business direction and defined roles give a sense of purpose to both the individual and the team. Leaders have the ability to strongly influence their corporate culture. Ensure that you are perceived as open and honest by living by the expectations that you set for others. Track organisational health and triangulate! Individuals need to feel confident that they can ‘speak out’ about unacceptable behaviour without fear of reproach. Be suspicious of the universal positivism and praise that often gets given to leaders – is it really so good? You can find out by testing views and opinions from employees as well as external customers and suppliers. You can also get external opinions through internal audits and anonymous third-party comment. Use your full ingenuity to work out how best your less scrupulous colleagues can ‘game’ your incentive plans and performance management. All such plans have unintended consequences if individuals focus solely on maximising the measure rather than the business. So, be sure to assess, for yourself, unintended actions and consequences of these plans. Chris Legge in his article examines the gaming of rules and the signs to look out for. For example, did delaying payment to Tesco’s suppliers improve individual measures of performance and incentive pay-outs? If we hear something from one source then we should listen and act, two sources and we should be concerned, and from three sources, urgent action may be required. Codes of ethics and conduct need to live. They need to become the unconscious competence of the business. Culture is hard to change but starts from understanding the current level of integrity within the organisation. Hence the need for the integrity barometer as a robust starting point for culture change. Increasingly major companies are taking the culture of integrity seriously. Culture change needs champions to set the example and lead teams towards different ways of working. Sometimes staff will not see the full picture and misinterpret the behaviour of others but the journey to achieving integrity will require experimentation and learning by both managers and staff alike. To complete the picture of effective internal governance we need to ensure that we have robust systems of internal control. This includes finance, accounting, audit, risk committees and risk management. These are all covered very well elsewhere. As with all other aspects of governance if these just become means to satisfy compliance with externally imposed rules, they may run the risk of simply placing ‘ticks in boxes’ rather than really influencing the culture of integrity. Psychological profiling can reduce risk by assessing and understanding individuals propensity to break rules, take risks and give an indication of their concern for ethics. This, combined with understanding the extent of their desire and ambition, enables firms to mitigate costly hiring mistakes. Toni’s article explores how you can predict whether new recruits will behave ethically. The policies and practices around our people are particularly important. One of the strongest assurances for effective internal governance is the development of your own senior management talent that understands both direction and values and instinctively gives the leadership required. Ask yourselves whether you are seeing and hearing outside your own echo-chamber. Regular feedback on progress with respect to outcomes and associated behaviour is also essential as it provides a productive framework for improvement and success. Constructive reviews ensure all employees are clear on their own, and the company’s, goals. Effective performance management gives everyone clarity of the goals and regular feedback on their progress both with respect to the outcomes they achieve but also against how they behave and act. Rewards and incentives need particular attention. The performance management system in Enron was really effective; it aligned staff to behave in an inappropriate way and then rewarded them handsomely. We work with senior management teams in many different countries and across a variety of sectors, and yet what unites them all is the fear that there may be something hidden within their organisations which could ultimately trigger a major issue. The qualities of the businesses and organisations that have been exposed in this way recently, and the clearly institutional nature of their issues, have brought this to the top of the business agenda. Senior managers cannot be everywhere all of the time, so how can they identify and prevent the growth of the attitudes and behaviours that lead to major institutional failure, or that grow the kind of ‘rogue trader’ behaviour that cost Société Générale nearly five billion Euros in 2008? The answer lies at the heart of the business. By having a clear set of ethics that every employee shares and lives by, these behaviours become unacceptable, and the organisation becomes self-policing. Strong ethics do not undermine a company’s ability to make money, instead they can actively prevent the issues that kill corporate value and, sadly, can risk the lives of staff too. “The meeting lasted 35 minutes. By the time it was over, WorldCom’s board of directors – who had been alerted at two hours notice and had received no written material and only the briefest of presentations – had unanimously approved a bid for a web hosting company costing $6bn”. We face a big dilemma. Do we infuse the business with even larger quantities of rules and regulations or do we trust our staff to make the right decisions? In reality the trade-off is between the density of our specifications (even assuming they will be read and implemented) and our investment in creating the culture of integrity. Organisation integrity is the responsibility of the Executive of the business to achieve. They will be accountable for its achievement to the Board. As the pressures to perform get ever greater, so too the temptation to take shortcuts and so tarnish the integrity of the business. No one wakes up in the morning deciding to corrupt the organisation. Loss of integrity comes from an accumulation of individual actions, each stretching the truth and integrity a little further. 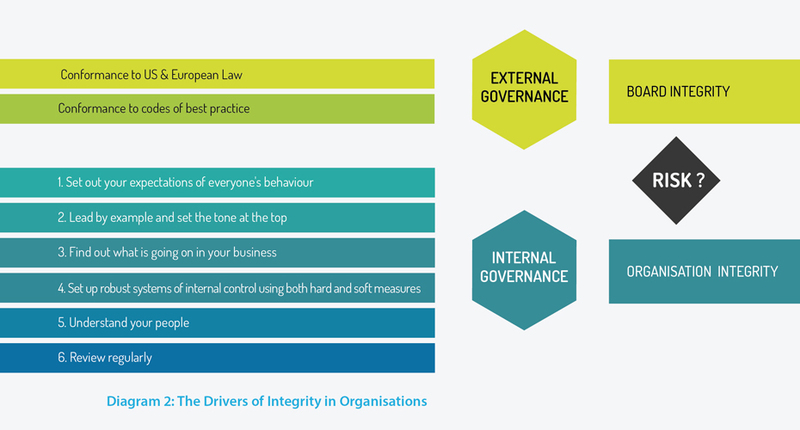 Executives need to build into their organisational development explicit measures of integrity and ensure that their actions consistently reinforce their codes of values and ethics.